I had closed out my little article on the original ‘Tron’, which I made a point of watching before watching this movie ‘Tron: Legacy’, by saying it did come up a little short on story and character, the two most important things in any movie, but it was still revolutionary. 28 years have passed since Tron’s extremely disappointing box office receipts back in 1982 probably cost a bunch of Disney executives their jobs… note that they did get my $2.75 back then so it wasn’t my fault… and now we have a new movie with a budget that’s roughly around the GNP of Canada, but this generation of Disney execs should be safe because I’m guessing this movie is going to make some money, despite the fact that the same problems that plague the original also have infected the new version, minus the revolutionary part. In 1989, seven years after the events we left behind in the original Tron, Kevin Flynn went to work on his pet project one day and never came home. In those seven years Kevin Flynn made his corporation Mega Soft… I know it’s not called that but I couldn’t remember the name of the company when I reviewed the original so I’m going to keep calling it that… Mega Soft is the top tech company in the land. Think Kevin Flynn to be something similar Steve Jobs minus Steve Jobs reported assholery. Where did Kevin go? Twenty years later Kevin’s son Sam (Garrett Hedlund) simply believes his father abandoned him, but we know it has to be more complicated than that. Mega Soft is still the biggest tech company in the world but now think of it as, heck I don’t know, Microsoft? Sam, every bit the tech guru his old man was, is still the majority stock holder but his only connection to the company is breaking in, stealing it’s software programs and releasing them as free open source on the Internet. Then one day Allan Bradley (Bruce Boxleitner) gets a page. You remember Allan, right? Allan knows in his heart that Kevin would never have abandoned his boy Sam and that something had to have gone terribly wrong and this page, one that could’ve only come from Kevin, proves it. Sam has his doubts but nonetheless he allows the old man to prattle on and eventually he makes his way back to the arcade, and this is where he makes the discovery. It’s a little complicated but somehow Sam finds his way into The Grid. The bottom line is that Kevin, his digital twin Clu and Tron the keeper of security were working to design the perfect system. Something kind of went haywire in this process which threw Clu into a tizzy, trapped Kevin in the system for the last twenty years, got Tron all derezzed and now Clu has a plan. It’s an evil plan. Sam, after managing to survive a couple of data disk battles and a light cycle jousting event, has reunited with his old man in addition to making the acquaintance of his old man’s defacto digital daughter Quorra (Olivia Wilde) and the trio must find a way to stop Clu, and his master digital assassin Rinzler, from executing his completely evil plan. Adventure will ensue. 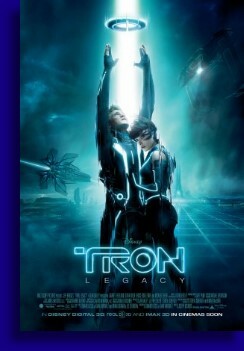 Let’s start out by praising director Joseph Kosinski’s ‘Tron: Legacy’. While it’s nowhere near necessary to have seen the original to enjoy this film, the nods given to the original were very nice. When I saw that dusty Coleco football game that Kevin was playing in the original I almost shed a tear. You could actually ‘pass’ your digital blip of a football in that game my friends. You young ‘uns would not and cannot understand this. Visually the movie is simply stunning. The light cycle transformations, the translucent digital trails, the lighted costuming… there is nothing about this movie visually that isn’t cool. All the graphical elements of the original touched up new millennium style is something to see. Another great thing about this movie is that Jeff Bridges is in it and me telling you that having Jeff Bridges is in your movie makes your movie better is like me telling you that water is wet. Finally, conceptually speaking, the movie is rock solid. So why didn’t I like it more? That’s very simple people, I felt completely disconnected from it. At no point did ‘Tron: Legacy’ involve me in any way into anything that was going on in this digital world at any time. I just sat there in my high priced theater seat watching the pretty pictures and listening to Daft Punk’s funky soundtrack with no emotional involvement with anything that was going on in front of me. I guess the emotional hook for this movie was supposed to be the relationship of father to son, but it would’ve helped if Garret Hedlund’s character of Sam was presented just a little more sympathetically to the audience. Jeff Bridges was great as a standalone character but Kevin Flynn in relation to his son, to Quorra, to Clu? It was all disconnected. A friend mine made the point that if any of the main characters were to die off in this movie, he wouldn’t have cared. I had to agree, with the exception that I would’ve really missed Allan Bradley if they had offed him in this movie because Bruce Boxleitner was looking like a suave gangsta in his London Fog. And speaking of Bruce Boxleitner, they probably should’ve changed the title of the movie from ‘Tron: Legacy’ to ‘Minus-Tron’ because Tron wasn’t barely in it. What’s up with that? If you’re going to watch this movie you might as well go ahead and make Disney happy and come off the $14.50 to view it in 3D/IMAX. Yeah, that’s a little more than the $2.75 we paid back in 1982 but progress costs. I only say this because with each progressive visual step down… IMAX down to plain 3D, 3D down to 2D… ‘Tron: Legacy’ progressively loses the edge on the one thing it does well. By the time we get to Blu-Ray and then DVD… all of the magic will be gone. You don’t want to lose the magic do you?